Many people knows Yogyakarta from its culture and heritage. The heritage cycling activity is a set of interesting scenery about ancient sites, rice fields and rural culture daily life. This trip provide a different style to enjoying Yogyakarta's tourism especially its ancient sites, so this will be a sensational experience in your holiday in Yogyakarta. The countryside trek gives you such a nice leisure and pleasure when enjoy and relax with cycling activity through many places of cultural heritage sites which include sacred famous temples, such as Prambanan temple, Sewu temple, Plaosan temple and other small temples nearby. Each trek have their own styles and variations, from the flat trek, side streets, many turns, up and down roads, and also hilly trek will give you another sensation. Start near the Prambanan Complex, the trip will pass Prambanan temple, Sewu temple, Plaosan temple, Bubrah temple and much more. During cycling you can see the temples outsite the complex. During cycling you can also see the life of rural communities and beautiful natural scenery with views of rice fields and numerous plantations of corn and chilli along the trip, you can witness the local neighborhoods and typical traditional houses along the tour. You can see the real of Indonesian daily life. 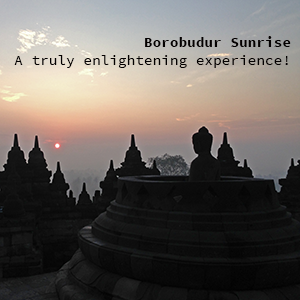 Tourjogja is your comprehensive resource for Yogyakarta and tours in Java. We provide tour packages about things to see and do, hotels and all the information you need to travel to Yogyakarta and surrounding areas.